All-American status is bestowed on a tiny fraction of college athletes, and this year three All-Americans are from Vassar. Swimmer Julia Cunningham ’17 finished fifth in the 200-yard butterfly at the NCAA Division III championships in Greensboro, NC, an achievement that earned her first-team All-American honors for the second year in a row. 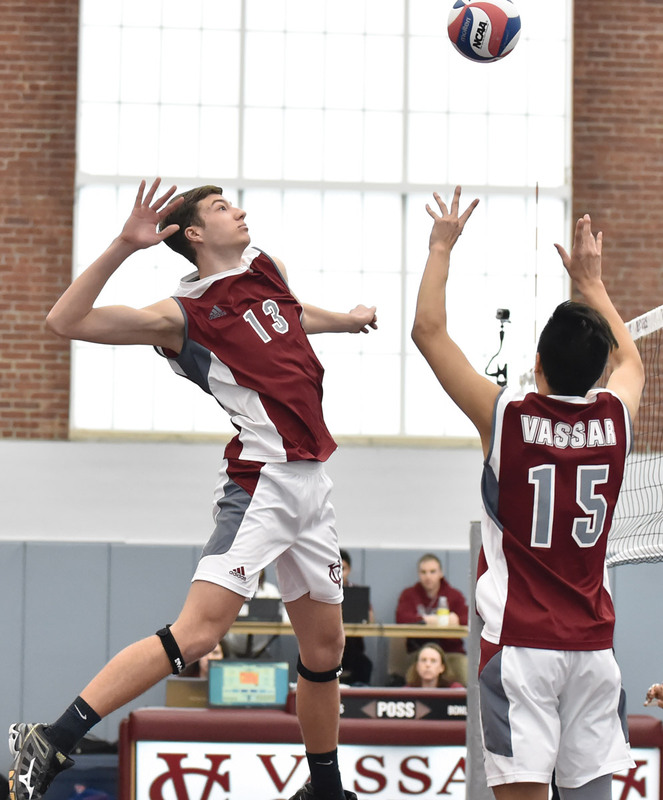 Men’s volleyball standout Matthew Knigge ’18 was selected a first-team Division III All-American by the American Volleyball Coaches Association. And Taylor Vann ’16 made Vassar history at the NCAA Division III Track and Field Championships when he became the first member of the men’s track team to earn All-American status with a fifth-place finish in the decathlon. Cunningham, an economics and Chinese double major from Yardley, PA, faced a challenge qualifying for this year’s national championships. Her times early in the season were slower than the marks she had established the year before, but she swam fast enough in the Upper New York State Collegiate Swimming Association (UNYSCSA) meet to earn an invitation to the NCAA event. And during four weeks of training leading up to the nationals, Cunningham found her rhythm. “By the time I got to nationals, I was feeling a lot more confident,” she says. 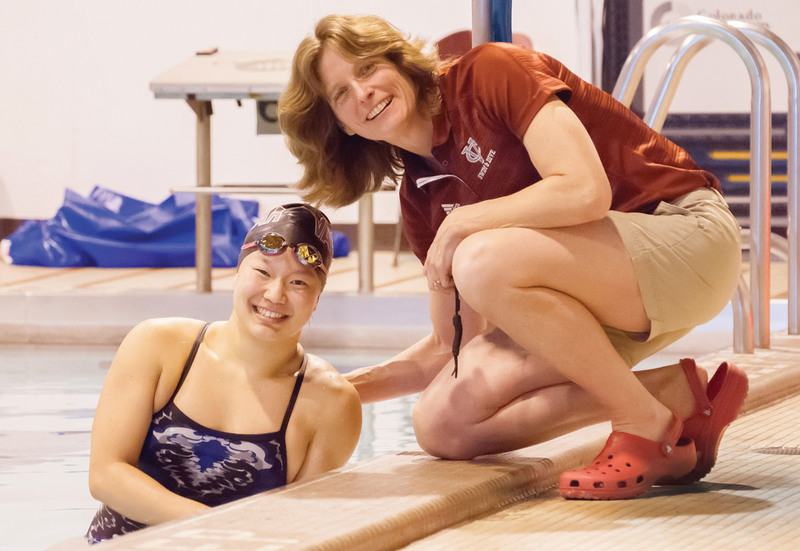 Head swimming and diving coach Lisl Prater-Lee and assistant coach Dan Koenig said that by the time Cunningham arrived for the national meet, they too were confident she’d excel. “We saw a lot of progress in that final four weeks,” Prater-Lee says. Apparently, she did. She broke her own school record in the qualifying race and smashed it again in the finals. Cunningham, who followed a strict dietary regimen during training, says she received an “NCAA survival kit” from her teammates that included sugar-laden granola bars and candy. “After the race, that candy was gone pretty fast,” she says. Unlike Cunningham, Knigge didn’t earn All-American honors based on a single end-of-season performance. He was selected after he led Vassar to a 24–7 record against some of the top competition in the country. The Brewers finished the season ranked eighth. Knigge, an international studies major, says he considers the honor a team achievement because, as a middle hitter, he relies on passes from his teammates. Head coach Rob Wolter agrees—up to a point. “For Matt to be nationally recognized, the team had to be nationally recognized as well,” he says. But the coach adds he knew he had a special player when he saw Knigge compete on a top club team near the student’s hometown of New Egypt, NJ. “I knew he was a gifted athlete [Knigge had starred on his high school basketball, track, and cross-country teams in addition to volleyball], but when you make that jump to college, suddenly you’re facing some players who are bigger, stronger, and maybe three years older than you are.” But Knigge put in his time with Vassar head trainer Cam Williams and after a good season his first year, made great strides this season, Wolter says. Knigge, an international studies major, expects to be ready for an even better season next year, thanks in part to his decision to enroll next fall in Vassar’s International Study program in St. Petersburg, Russia. “Volleyball is an extremely popular and competitive sport in Russia, and I plan to join a team when I get there,” he says. at the NCAA Division III Track and Field Championships. Vann, an environmental studies major from Coventry, CT, finished the grueling two-day, 10-event competition at Wartburg College in Waverly, IA, on his 22nd birthday, the day before Vassar Commencement. He won the first event, the 100-meter dash, but with just two events remaining, Vann was in 10th place, and only the top eight finishers would be named All-Americans. 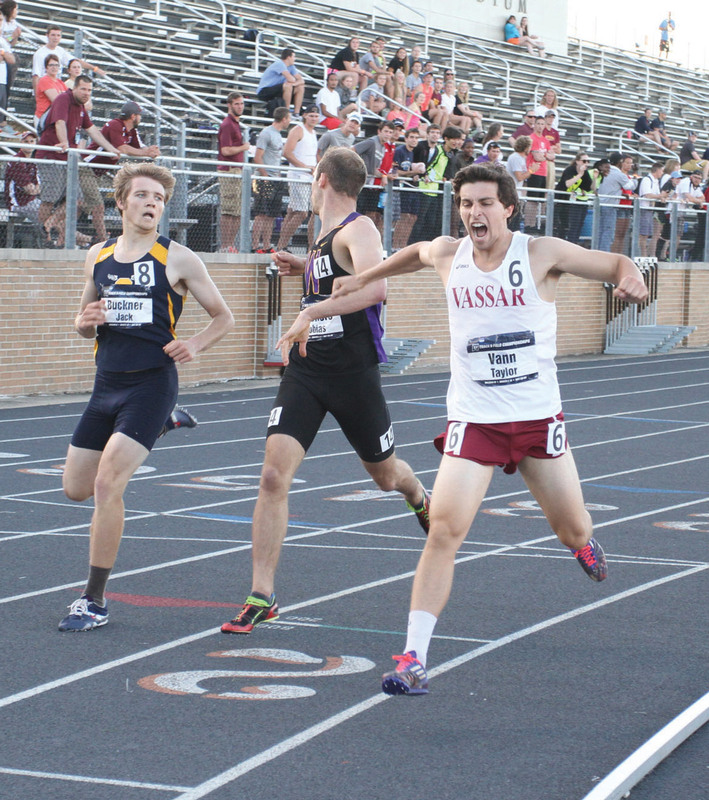 Vann responded by winning the javelin throw and then finishing first in the 1,500-meter run, eclipsing his best time by nearly 11 seconds. Competing in the decathlon on the national level was a goal Vann and his coaches, Justin Harris and James McCowan ’99, had talked about soon after he joined the track team. Though a soccer, basketball, and track star in high school, Vann knew he still had a lot of work to do to excel on the collegiate level. With lots of practice behind him, Vann posted one of the best scores in the country at a meet in April at Connecticut College. And as this year’s NCAA competition approached, Harris said he was confident Vann had the all-around skill to compete with the best athletes in the country.